The Edmonton Oilers have had the No. 1 overall pick in three of the last four NHL drafts, which makes them the closest thing pro hockey has to the NBA’s Cleveland Cavaliers — except for the Oilers’ rebuilding project wasn’t sparked by the franchise losing the best player in the world. And while Edmonton currently holds the No. 3 pick in this year’s draft (June 27-28), a rumor is out there that they could acquire the No. 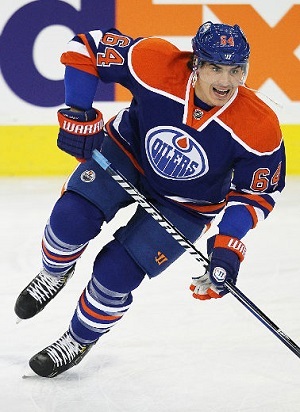 1 pick again if they’re willing to trade away Nail Yakupov, one of the No. 1 picks already on their roster. When Yakupov was taken by the Oilers with the No. 1 pick in 2012, he became the first Muslim player to be chosen that high in the NHL draft. The 20-year-old wing from Russia was promoted to Edmonton’s major-league squad almost immediately, and while he had a strong rookie season in the NHL, he struggled in Year 2 with just 11 goals and 13 assists in 63 games. The Oilers missed the postseason and finished in last place in the Western Conference, while Yakupov registered minus-33 on the plus-minus scale. Due to that, and due to Edmonton’s abundance of talented young scorers but its dearth of solid defensemen, Yakupov has been involved in trade rumors for months now. “Is there an Edmonton-Florida deal to be had along the lines of Allen’s speculation, maybe moving Florida’s first pick and a top young player for the Oilers top pick and a player like Yakupov? Such a deal would ensure Edmonton gets Ekblad. Florida apparently needs a winger, so maybe such a deal makes sense for them.